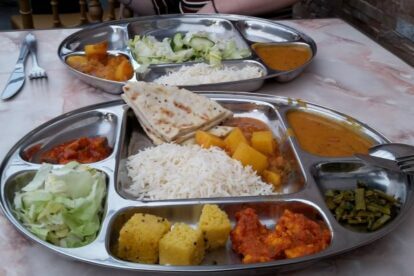 Aahaar Indian Cuisine – Your stomach is welcome! The Aahaar is one of my favorite restaurants if I don’t know where and what to eat but want a cosy place that meets my taste and budget. It always turns out to be a good choice. The food is healthy and traditional Indian. You can chose from a menu, but every day they offer a buffet from which one can try everything that meets the eye. It’s all vegetarian and has different levels of spiciness. I like to come here with friends to just enjoy the food and have a good conversation with a feeling of being at home. My favorite drink is Mango Lassi; it’s refreshing but sweet and it keeps the level of spiciness in my mouth under control, which I appreciate a lot. You can choose from the buffet as much as you want, but it is appreciated to eat your whole plate and not waste any of the food.